Many people pack an iPad when they travel, usually for email and downloaded content from Netflix to pass the time. I have been using iPads for most of my work, and all my urban sketching for over 5 years, and I can tell you from experience that it is an incredible device for sketching spontaneously, and a truly fantastic kit when you travel! Whether you’re heading to a local sketchwalk or traveling the world with an eye on luggage allowance, it’s hard to beat the versatility of an iPad, Apple Pencil and Procreate. Over a weekend this spring, I’ll show you how your iPad, Apple Pencil and Procreate can be the ideal travel sketching companion for you too. 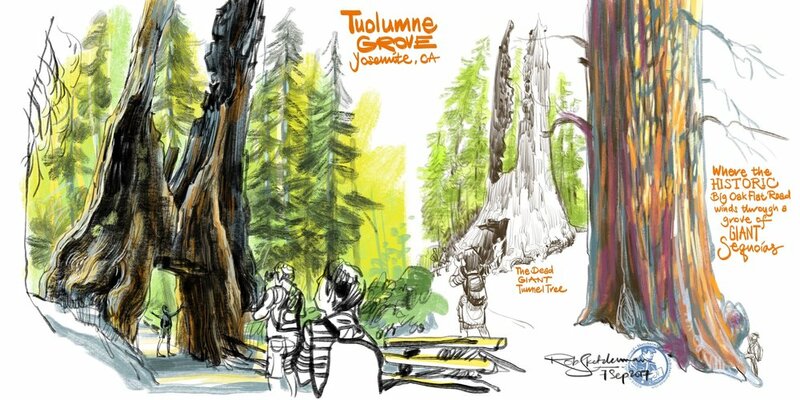 I decided to offer this 2-day Travel Sketching with an iPad workshop so you’ll have enough time to get familiar with tools, try techniques, and ask all the questions you need. We begin with demos and exercises indoors that will help you become familiar and confident with the tools and interface of Procreate. Then we head outdoors the rest of the time, where I show you how to make full use of your Mobile Digital Studio to work both fast and slow, so you can take advantage of 5 minutes while the family takes a bathroom break, a half hour before friends arrive for dinner, or a couple of leisurely hours in a museum on your own. Being comfortable with using an iPad, Apple Pencil and Procreate requires a shift in thinking and knowledge beyond simply what to click for your favorite brushes. Just like the first time you may have learned about the many ways to tackle watercolors, digital sketching has a learning curve too. The exercises I have planned will help you understand how and when to use layers, how to manage your files, ways to experiment with and mix multiple media, and most importantly, how to look at a scene and create a digital sketching game plan with the time you have. Travel, whether to exotic locations or even a neighborhood you’ve seldom visited, can reveal wonderful stories, and as urban sketchers, we’re all about that, aren’t we? I’ll also show you how to capture and compile a variety of visual stories, wherever your sketchwalk might take you to, and whatever your skill level might be. There will be some one-on-one time for all participants, and I will also happily offer guidance to anyone who wants it, to improve not just skills with an iPad and Procreate, but also to help take your urban sketching to the next level. I will also bring printed material so you can see how artwork translates from screen to print, and we’ll discuss the many options you have to share your work. My hope is that you’ll immerse yourself with gusto, try all I have to show you, and leave on Sunday evening much more confident, and able to whip your iPad and Apple Pencil out to sketch at a moment’s notice. A few minutes before we had to head to the departure gate, and no time for full color. What would have been another travel blur is now a memory I can actually recall because I drew it. Learn how to maximize a few hours in a museum when there are thousands of wonderful artifacts that beg to be drawn. An iPad that works with an Apple Pencil is required. A case / holder that allows you to use your iPad comfortably outdoors. A stool / chair for sketching if you have one. For more information on recommended iPad gear, please refer to this blog post. Working with an iPad allows you to create in almost any style you choose. Make a quick line drawing or get all painterly - it’s up to you. Being able to work in layers gives you incredible flexibility with your composition. Change your mind if you like, and add an element that just caught your attention.